After a summer in Madrid many moons ago and being spoiled in New York with top-of-the-line tapas joints, I must say I've been utterly unimpressed with a few in California that purport to serve tapas, including La Paella, The Courtyard and even Zarzuela in San Francisco. I admit I haven't tried Cobras y Matadores or Bar Celona in Pasadena, but suffice it to say that I was so desperate I cooked my own Spanish feast at home. I am officially addicted to PBS show, Made in Spain hosted by chef Jose Andres, although I am miffed that he doesn't post his recipes on the Web site (I type the recipes as I watch TV). So when I heard that Bar Pintxo evoked tapas bars in Barcelona and was actually inspired by a popular bar there, I hopped right over. That Joe Miller of Joe's fame in Abbot Kinney was the owner helped, although I lament that Joe's has been on the decline lately, a quick fall from being one of my favorite New American places. Bar Pintxo was decent but not great. The sangria was passable. The foie gras on bread was the best and the jamon iberico was ok albeit too thickly cut. There were more duds than successes, but I would recommend it for the ambiance and some of the good dishes. We started off with a very refreshing cava, a sparkling wine that looks like a rose. We had Avinyo Rosat Alt-Penedes, which was pricey but good. Because the portions are so small and prices relatively low ($2-12), we sampled almost everything on the menu. The chorizo with the sunny-side up quail egg looked inviting and was a good mix of salty and runny texture. Then again, it's hard to go wrong with chorizo, or fried egg, for that matter. The croquettes were also good. Then again, anything fried is usually good. The spinach salad with hazelnuts and golden raisins had a good mix of flavors and texture -- crunchy and salty with some sweet undertones. The bread that many of the tapas came with could be improved. The sofrito, that versatile and usually tantalizing mix of tomatoes, onions and some spices, fell flat on its face. It had absolutely no flavor and even the texture felt wrong. The radish, jicama, cilantro, avocado and lime dish sounded great but was a tad bland. Dates wrapped in bacon with cabrales cheese was ok. What was most upsetting was the tortilla espanola that was far too eggy and flavorless. Other mediocre dishes included gambas al ajillo, or garlic shrimp whose flavors didn't pop. The flatbread with mushrooms, piquillo peppers, caramelized onions and basil was decent but didn't wow. The second most disappointing dish was the black squid ink rice with clams and shrimp. It held so much promise but the rice was dry and crumbled like sand in your mouth. Oh, and let's not forget the lack of flavor, again. Maybe it's the tiny kitchen space but if all those amazing tapas joints do it in Barcelona and other Spanish cities, this one should too. Another pet peeve: charging for basic tapas like manzanilla olives that come out for free in the home country. Equivalent to charging for kimchiand other banchan, or side dishes, at Korean restaurants. Actually, only the least authentic ones do charge. Should this be a gauge of whether to patronize this place? Hope they work on raising the quality of the food but for now, it's a place to go for a quick bite and drink because those bar stools were not made for sittin'. Stick to the ham and foie gras and cava and you'll be transported -- at least until they bring out the tortilla espanola. What did I know about Hawaiian food before I went to Aloha Cafe? Not much. I've had mediocre kalua pork before and the super-soft and fluffy Hawaiian bread. So it was with some trepidation that I walked into this Hawaiian joint smack in the middle of Little Tokyo at Honda Plaza next to Sushi Gen (the long lines here are always a mystery to me but that's another post) and Kagaya (ditto unless you are on an expense account). I'm no Hawaiian food expert but I liked what I ate. I had the char siu pork, which is barbecued pork slow-baked and basked in a salty and slightly sweet marinade. The pork slices were tender and went well with the two scoops of white rice. It's the strangest mix but I actually liked the macaroni salad and coleslaw that accompanied the dish. Another plus: those everyday low prices! Specialties that come with rice and salad range from $6.25 to $9. Breakfasts are under $6. Most bowls are under $5. The lau lau pork was fairly tender and had absorbed smoky aromas from the taro leaf it had been steamed in. Not having had the real deal, I can only comment on this one, which was good for a quick lunch but not revolutionary. My eating companion, however, was significantly more exuberant, declaring this place a new find. Maybe it had something to do with the fact that Aloha Cafe offers dishes with: 1) fried eggs, 2) corned beef hash (or choice of vienna sausage or of course, spam), 3) meat patties (loco moco) and 4) plenty of gravy. The corned beef hash was very popular with some but not so much with me. The meat patties were tasty if not a bit greasy. And I'm not a huge gravy fan so you won't see me ordering the loco moco anytime soon. But gravy lovers may indulge in some serious gravy-fest (see below). I wouldn't recommend trying the tofu dish or the soup, which were uneventful. I would stick to the classic Hawaiian dishes and you'll be sold. The ahi poke was ok but I'm a sushi/sashimi snob so the quality of the fish didn't do it for me. Service was laid-back, a-la-Hawaiian, although only the cook is apparently from there. This place recently relocated from its original Alhambra location. Validated parking available in the mini-mall. I was never a huge Pinkberry fan so I was glad Yogurtland came to the rescue. 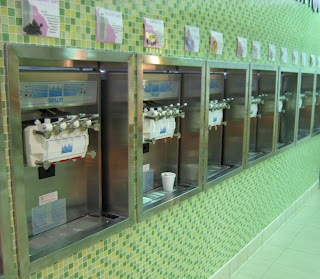 Yogurtland is self-service, has more flavor and topping options -- and as if that weren't enough, it's cheaper too. To be sure, not all of its many flavors were winners. I think the only ones worth having are taro and maybe peanut butter. I haven't tried the kahlua but all the others, including mango, lychee and green tea didn't do it for me. Because it has self-serving machines, you have the cool option of having half and half for every other flavor offered. Remember those old soft ice cream dispensers? You get to play with those! After you add as little or as much as you'd like, you choose from an array of dry (mochi, corn flakes and jelly beans, among others) and wet toppings. The wet toppings were the usual suspects such as mangos, berries, kiwis, etc. But by far the best topping was the sweetened red bean, although it could have been a little more syrupy. To recap, my favorite combination was the taro topped with red beans, mango, blackberries and bananas. It was almost like my favorite Korean summer dessert, patbingsoo except it didn't have the slushy shaved ice. Still pretty satisfying. You could taste as many flavors beforehand. It was only 30 cents per ounce, so it ended up being a drop in the bucket compared to the Pinkberrys and Red Mangos of the world. This chain is also Korean-owned but don't think it originated in Korea. Here's my report from the latest burger club venture: Weiland Brewery. We gave it a thumbs up, especially for its price compared with gourmet burgers that break the bank. The meat was cooked medium rare as requested but the patty was not as flavorful as it could have been, although much less pasty than Hungry Cat. Overall, I'd give it decent marks. I know I sound like a broken record, but it still doesn't come close to Houston's. Even the bbq sauce I got on the side that has become a staple burger condiment for me was too sweet and not deep-flavored at all. As for the fries, they were greasy and lukewarm. I mean, they didn't even look good. Weiland definitely needs help in the fries department. The dark and slightly drab interior didn't help, mostly because I like to see my food when I eat it. But it's nice having a wide beer selection, although if I had a choice, I would go for a glass of full-bodied cabernet over beer to wash down my bloody red meat. Some might say it is pretty darn pretentious to sip wine with the down-home, all-American burger, but red meat is red meat. Got to have it. In any case, it's good to know we have a fall-back for a relatively affordable burger. And it has a downtown location in the Paul Hastings building's food court -- one of the most poorly designed and most depressing food courts ever. Stuck in a basement with no light, sparsely populated with disgusting fast food chains and dubious food that purports to be Indian, I would probably never go there if it weren't for the post office and this brewery. Next stop: Twoheys in Alhambra (Web site under construction as of May 11). If you think you've had fall-off-the-bone pork that's been braised forever, you're in for a surprise. Our trusted source for all things San Gabriel Valley, the C-man and his family, generously let us in on their favorite pork haunt -- Lake Spring Shanghai Restaurant in Monterey Park. The specialty pork dish called House Special Ham Hock was a thing of beauty. Ok, it didn't look pretty (pictured left is what it looks like when it arrives at the table) but the amazingly soft texture and succulent flavor all but made up for it. For unsuspecting onlookers, the dish is an intimidating mountain of brown blob, sitting atop a bed of steamed greens. It's the "lower elbow part of the pig," according to my source, braised in soy sauce, star anise and many other spices for hours. The blob you see is skin with a layer of fat underneath and smothered in the aromatic, dark-colored marinade. The meat -- which revealed itself like a wonderful surprise when the waitress deftly opens up the blob using two spoons -- was best appreciated when consumed in tandem with the oh-so-flavorful skin and fat. It was sweet and salty at the same time and so subtle that you could savor the essence of the pork meat. The steamed greens added a refreshing touch to the meat and skin combination that could be a tad heavy if eaten by itself. It was probably one of the best pork dishes I have ever had. I highly recommend it. My next favorite was a shrimp duo, the Jade Shrimp and House Special Shrimp, that could be had as two half-orders for variety. The delicate and mild-flavored Jade Shrimp got its moniker from a pea-based sauce it is pan-fried in. It was very soft in texture (not overcooked) and complemented some of the saltier and spicier flavors on the table very well. The House Special Shrimp was deep-fried and smothered in a garlicky sauce that is both sweet and spicy, almost like buffalo wings. It reminded me a bit of the Korean style Chinese dish called kkanpoongki, which is wonderfully garlicky deep-fried chicken pieces smothered in a similar sauce. I also liked the dried sauteed string beans, which also had a tinge of garlic, and mapo tofu, the decidedly non-Shanghaiese dish that was decent but maybe we shouldn't have ordered that in a restaurant with Shanghai in its name. The dish I thought wasn't as stellar as the rest was the fish fillet in garlic sauce. The fish wasn't as fresh as it could be and it tasted like the fish had been fried a while back and had been refried one too many times. Oh, we also had the soup dumplings but I'm not going to honor it. Basically no contest to DTF. Not even to Mei Long Village. But I don't hold it against them because that's not what they're known for. Parking is easy and no reservations required. I was surprised, in my bias, to see that the place seems to be owned by a non-Chinese person. I was also surprised to find on Gayot that the place had closed down, which it had not. We capped the meal with a sweet sticky rice dessert. It was ok but I longed for an intricate dessert that had been described to us by the C-man. Alas, it wasn't available that night so naturally, I craved it even more. We had to settle for lychee drinks and taro balls at Tea Station in Alhambra, which weren't terrible alternatives.